A stencil mask cut on a vinyl cutter assists air brush graphics. An additional use for self adhesive vinyl is as a stencil mask for custom painted graphics. Vinyl is most often used for decals and letters; but in this case vinyl can be used as a stencil masking film as an aid for applying paint. 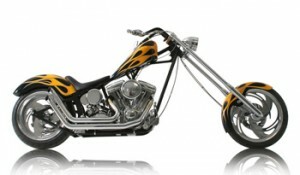 Custom auto or chopper artists combine pin striping and airbrushing to decorate vehicles. Precise placement of airbrush-applied paint requires a stencil mask. Back in the dark ages, when I was in college earning my BFA, we used Amberlith or Rubylith stencil film, cut with an Xacto knife. These days, you can do the same thing with a vinyl cutter and some paint mask film. In fact, Orange County Choppers uses a Vinyl EXPRESS vinyl cutter for cutting stencils for some of their custom choppers. It makes an occasional cameo appearance in their graphics department. More custom paint shops are discovering this application. You can create the artwork digitally and output the shape of the mask to just about any 24” vinyl cutter and cut it using an adhesive backed stencil mask film. This film is essentially a calendered vinyl with a removable adhesive. We stock several varieties of dedicated paint mask films, including ORAMASK 813 and GAP’s spray mask film. ORAMASK 810, 811, and 813 are all 3 mil calendered films with low tack removable adhesives. 811 and 813 are for smooth, flat surfaces. Oracal designed 810 for flexible or uneven surfaces. You can buy it with a solvent based adhesive in the 810S version. The use of a removable solvent adhesive makes it more suitable for use with solvent based paints that may weaken the acrylic adhesives used in most stencil films. For more about the differences between solvent and acrylic adhesives, refer to our Sign College Newsletter #2. These products are great for most paint mask applications. But what do you use when you need to apply a stencil to a compound curve like a “fat bob” gas tank on a chopper? You may find that a 3 mil calendered film doesn’t hold the surface as well as you’d like. Try ORACAL 751, an affordable 2mil cast vinyl. 751 has a permanent solvent adhesive. The solvent based formula will work well with a variety of paints. But won’t a permanent adhesive cause problems in a paint mask application? Not necessarily. It has more tack than the removable variant found on 810S, but permanent adhesives take about 24 hours to cure. If you remove the mask before then, it will take just a little more effort than a paint mask film. Even after 24 hours, it will be harder to remove—requiring 4 lb/in of force as opposed to 0.25 lb/in– but it will still come off cleanly in one piece. It’s not the primary application for which ORACAL engineered it, but it can work. Speaking of nonstandard uses for vinyl, ORACAL 751 can also be used as a stencil film for etching wineglasses. I had a customer in Kentucky a few years back who insisted that it worked better for her than the dedicated 10mil stencil made for glass etch work because of its excellent conformability on compound curves. And there are lots of customers for whom the paint mask stencil film of choice is not a paint mask film at all. They prefer MACtac 8900 vinyl in buttercup yellow. Engineers make these products, but they’re used by artisans. As long as artisans use their creativity we will keep hearing about and sharing new approaches to old problems.